Tucked in at the end of a quiet cul-de-sac is this beautiful country. For information, call Leigh Ann Lengyel Clarke at (203) 984-5880 or Brian Clarke at (203) 246-4771. For information, call Susan Vanech at (203) 685-2348. For information, call Val Wyman at (203)451-5959. For information, call Mary Bozzuti Higgins at (203) 216-7999. Stately Center Hall Colonial set in a sought-after convenient Wilton neighborhood. For information, call Brian Clarke at (203) 246-4771. I publish a magazine on real estate (and other interesting things). If you would like to receive a copy in the US Mail or by email, please let me know. Take a look at how I improved the pictures for one of my vacant listings. A kitchen that follows all of these rules is almost guaranteed to be both functional and safe. See how many rules your existing kitchen violates for a better understanding of why it may seem awkward and hard to use. Everyone knows Weston’s schools are top-notch. Here’s a list of specific reasons why. Here’s a link to the 2012 Year-End Market Report by William Pitt Sotheby’s International Realty. It reveals some interesting trends. 2013 Economic Outlook – Worth the read! Here’s an Economic Outlook for 2013, by the NATIONAL ASSOCIATION OF REALTORS(r). It’s worth the read. Only 3 pages. Mostly summary charts and graphs. During the 30-day sales period ending July 5, approximately 211,000 homes were sold in 98 of the top 100 metropolitan statistical areas, research firmDataQuick said Thursday. Out of the six houses I showed to two clients yesterday, I had problems getting into three. The spring home-selling season got off to a strong start in April, the Commerce Department said Wednesday, with rising sales and prices providing evidence that a housing market recovery was gaining some traction. At least the guys at the top are making sure “baby” gets a new pair of shoes (even if they have to layoff a few thousand employees, to make all those stock options worth more). Toll Brothers, the luxury-home builder, reported a second-quarter profit that beat estimates as orders rose in an improving housing market. 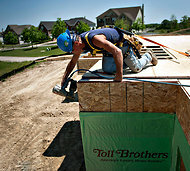 A Toll Brothers development being built in Elgin, Ill. The company reversed a quarterly loss. Even Oprah is losing money when selling in this real estate market. Weston High School ranks 163 in Newsweek’s 2012 “America’s Best High Schools” list. In addition Redding’s Joel Barlow High Schoolranks 778. Trust your gut; it’s smarter than you are. Today is already turning out to be a great day for real estate in Wilton, Connecticut. Do you cherish Monday mornings? About 2% of Greek population fraudulently took $1 Billion a year. This is probably not good for us either. Trulia’s forecast is probably the consensus of the mood out there. Even if they cost a lot and lead to high property taxes. Sometimes you can get a break on your Taxes, when doing things to your home that you would be doing anyway. Today is a big day. I’ve arranged a meeting with five people to focus on strategies and systems to increase visibility of my listings online, to get more exposure for my Seller clients. That is indeed with a B for billion. BofA is “proud” that it still takes them THREE WEEKS to consider a Short Sale offer! Does 7 months of falling unemployment mean it is really over? I hope so. And its certainly not bad news. That’s for sure. This Nantucket style cedar shingle custom colonial residence with Hamptons style beach stone driveway is an unrivaled masterpiece. on cul-de-sac in popular Greenfield Hill neighborhood. Truly a stunning departure from the ordinary! This Eclectic Riverfront Retreat is part Antique and part Barn. On Westport border, in luxury neighborhood. Good news. But notice the comment about how the mild winter helped. Hopefully this good news will continue. Copyright 2011. Ryan Cornell, William Pitt Sotheby's International Realty, 232 Danbury Road, Wilton, CT 06897. Licensed in Connecticut. This information was last updated Wednesday 24th April 2019.